Amazon has Pantene Pro-V Daily Moisture Renewal Conditioner 40 Ounces for $13.99. Free shipping with a $35 order or free 2-day shipping with Amazon Prime. Erases the damage of 100 blow-drys when used with Daily Moisture Renewal Shampoo for hair that?s soft, silky and manageable. Formulated to act like your hair?s natural lipid layer to help control the flow of moisture. To help block the protein-stripping, weakening effects of copper minerals in water use as a system with Daily Moisture Renewal Shampoo. This entry was posted in Sale on February 28, 2015 by Crodeal. Amazon has Pro-V Daily Moisture Renewal Hydrating Conditioner 20 fl oz (Product Size May Vary) for $3.29. Free shipping with a $35 order or free 2-day shipping with Amazon Prime. 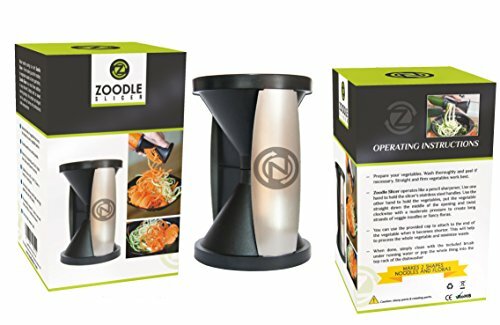 Amazon has THE ORIGINAL ZOODLE SLICER – Premium Vegetable Spiralizer, Spiral Slicer, Zucchini Noodle Pasta Spaghetti Maker, Create Both Julienne Spirals & Fettuccine Floral, (Cleaning Brush Included) for $13.99. Free shipping with a $35 order or free 2-day shipping with Amazon Prime.